The Best Thing About You Is You! 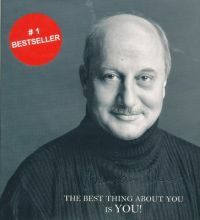 is Bollywood actor Anupam Kher's attempt at playing a completely new role. In this book the actor-turned-author uses instances from his own life to inspire and motivate his readers. The author provides his readers with subtle anecdotes of his own experiences and utilises them to guide his readers into lead a peaceful and contented life. His writing is inspirational and encourages the reader to introspect and look for one's real self. Kher encourages the reader to look at life in a positive manner and to use that positivity to counter all the negative forces in one's life. Today, people are gripped under the stress of daily life and feel insecure, frustrated and unhappy due to the pressures of work and other routines. But Kher recommends optimism as the cure for all of these problems. He cites his own humble upbringing to demonstrate how it is not impossible to reach great heights, even if one's resources are few. One need not be born with a silver spoon in one's mouth in order to attain success. However, he also sounds a warning bell to those who may be overcome with success and lose their way. He says that it is important to remain humble and gracious no matter how high one has reached. The Best Thing About You Is You! was published by the Penguin Group in 2014 and is available in paperback. Key Features: It is a guide to success and positive thinking. Anupam Kher is a seasoned actor with more than 450 films to his name in a career which has stretched for more than a quarter of a century. A few of his most acclaimed movies are Saransh, Daddy, Tezaab, Karma, Saudagar, Hum, Dilwale Dulhaniya Le Jaayenge, Bend It Like Beckham, Kaho Na … Pyar Hai, Khosla Ka Ghosla and A Wednesday. Kher is also a versatile theatre actor. His solo play called Kuchh Bhi Ho Sakta Hai is quite famous. Apart from this, Kher also runs an acting academy in various cities in India and one in London and has even donned the director's hat. He has numerous national awards to his name. He has also held several important posts such as that of the Chairman of the National School of Drama, New Delhi and that of the Indian Censor Board.